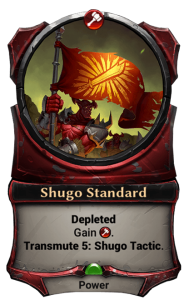 New sets in any TCG/CCG that supports limited are always exciting. Every card down to the lowliest common matters, which means we’ve got 275+ new moving pieces to incorporate into our drafting mindset. I’ve been traveling like crazy the last two months, which has meant less time to play/write, but I’m finally back into my daily routine, which means it’s time to finally get into analyzing the Fall of Argenport format. I suppose it’s good I didn’t immediately crank out this article, since there were a number of buffs/nerfs a few weeks in that shifted the format slightly (RIP Sheriff’s Hat). In this article, I’ll be discussing primarily commons and uncommons, as those are the cards that show up in high enough numbers to really define a format. Sure, there are tons of powerful rares and legendaries, but you can’t craft a game plan or strategy around opening a particular rare in Pack 4. I also won’t mention every card, only those that I have found to be noteworthy. 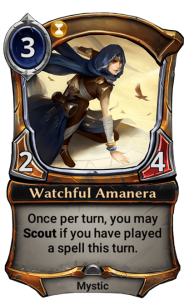 If you want an overview of every card in the set, along with grades, check out the set reviews over at rngeternal. You can’t draft without packs of cards, so let’s start there. Like Dusk Road, we’ve got two packs of the new set bookending the draft (packs 1 and 4). However, where the middle packs used to be a pack each of Sets 1 and 2, they’re now the same: a single curated mash-up of Sets 1-3. This is honestly fantastic on the part of DWD, as it allows them to introduce novel themes in the new sets while maintaining some sense of coherence by culling cards that just don’t fit anymore. The curated packs are a rather large set, 443 cards (about 110 each of commons and uncommons, with the other 220ish cards filling the rare/legend slot). 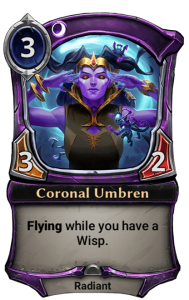 That means you can’t count too much on seeing particular commons or uncommons to fill out your deck, but at least the majority will fit somewhere into the Fall of Argenport themes instead of just being stone-cold whiffs (looking at you, mentor-matters cards during Dusk Road draft). This article won’t dive into the contents of the curated packs, since that would be a lot to cover. 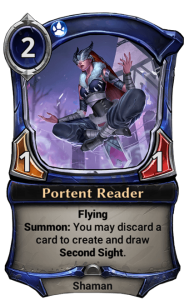 I plan to write a separate article hitting some of the highlights, particularly the cards that have changed in value from where they were before Fall of Argenport. Fall of Argenport brings along a few new keyword mechanics that show up quite often at low rarities. 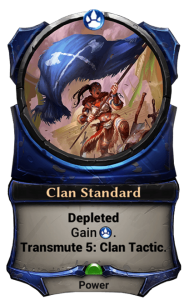 These keyword mechanics tend to give an indication of how the format is going to shake out — the developers gave them specific names for a reason. Berserk units can attack twice in the same turn. The caveat? They can only do this once, but when they do, they become Reckless for the rest of the game. Thus, you’ll need to be careful about when you utilize your free attack, or else your Hotblood Barbarian is going to walk into a 3/3. This obviously favors aggression on average, but there are some big midrange finishers with Berserk as well. Berserk appears in Fire, Primal, and Shadow. 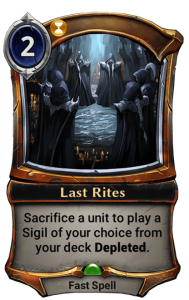 Appearing on both units and non-units in all factions, Tribute grants you an extra bonus (usually stats) if a unit went to your void this turn. This only checks at the time you play the card; a unit entering your void later won’t turn on any tribute cards you have already played. However, note that a unit simply has to have entered your void, not necessarily from play. “Looting” (drawing and discarding) or other ways to put units from your hand/deck into your void will count for Tribute. 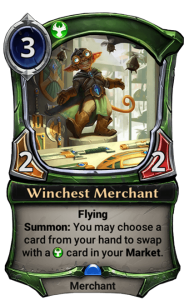 This mechanic also slants toward the proactive/aggressive decks, since you’ll be able to dictate the pace of play and force your opponent into taking trades. Once they do, you follow up with a high-pressure Tribute threat that is hopefully larger than they can handle. There are no Tribute cards with Ambush, so only the attacking player will get to benefit from Tribute. 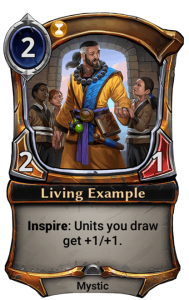 Units with Inspire will grant bonuses (stats or keywords) to any unit you draw while they are in play. Note that there are other ways to “draw” a unit besides from your deck, e.g., Dark Return or “create and draw” type effects. Inspire applies to those. Inspire is somewhere in the middle of the aggro-control spectrum. On the one hand, many of the Inspire creatures are cheap dorks, e.g., 2/2s for 2, but you don’t want to be as freewheeling with them as an aggro deck might want from its units. Trading your Living Example for a Learned Herbalist isn’t what you want to be doing most of the time, which leads me to believe Inspire is better suited to midrange decks that want to go taller in the middle part of the game. 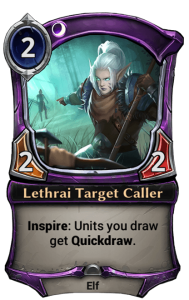 Giving your 5/5 Berserk or Quickdraw is veeeery nice. 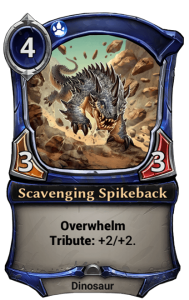 Perhaps the most exciting mechanic in the set, at least to a seasoned limited player like myself. I always loved the Kicker mechanic from Magic, and this is essentially the same thing. When you play a Spellcraft weapon, you have an option of also paying the Spellcraft cost to play a spell along with it. 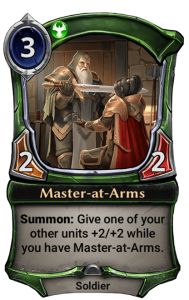 Weapons have the inherent downside of being 2-for-1s if your opponent can deal with the unit, but being able to get a card’s worth of value out of the Spellcraft eliminates that. It also gives you flexibility on your curve. You can play the weapon alone on turn 3-4, or wait until turn 7 for an extra bonus. Properly managing that will be a very important skill in this format. I’ve lumped these together because they play out similarly, just in different factions. Spells matter a lot in this set. Fortunately, there are a number of enablers for this. Spellcraft weapons do count as casting a spell (though that is expensive), and they do put a copy of that spell into your void. There’s also the cycle of 2-drops that let you discard a card to create a spell in your hand. Those guys can help you exchange extra power or expensive cards for cheap spells to turn on your spells-matter cards. 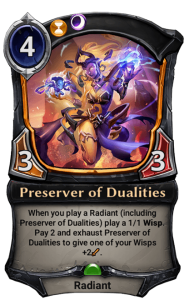 The only real tribal mechanic this time around is the Radiant/Wisp dynamic in Time and Shadow. Wisps are cheap little dorks; Radiants buff those dorks and get bonuses if you have little Wisp friends for them. The density of this theme is not that high, but it’s very powerful when the synergies do come together. 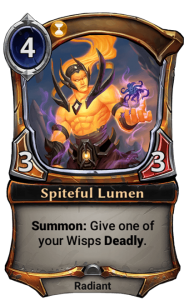 My experience has been that the Radiant half is plentiful, but finding good Wisps is difficult. It hurts that the best common for this deck (Illumination Wisp) is taken highly by all Time decks because it’s a great blocker that won’t trigger tribute for your opponent and can also chip in while doing so. I love cards like this. Value lands were always a favorite of mine in Magic, and these cards take that a step further thanks to the digital nature of Eternal, literally becoming spells later in the game. 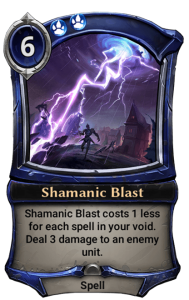 I have not had a draft deck yet that was truly starved for playable cards, so there is not a huge opportunity cost to taking one of these early, and the upside is quite nice. If you’ve got a pair of Tactics in a deck, you effectively buy yourself 1-2 extra card slots, which means you’ll flood out less often than an opponent with zero Tactics. As a general rule, I treat each of these like half a power in deckbuilding if I intend to play 6-drops, and a full power if I don’t have anything above 5. I mentioned these guys a bit in the spells-matter section, but they are worth discussing in greater detail. 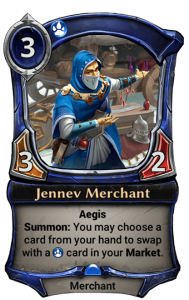 Combined with Spellcraft and Tactics, these type of cards give you a ton of flexibility in each individual game while not costing you too heavily in deckbuilding. Each of these units is a serviceable, if not exciting, body on its own, but some give you the ability to exchange a useless 7th power or unplayable splash card for something real. 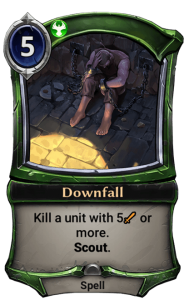 The other cycle lets you beat down early-on, then cash the unit in later in the game for a small effect. Once players hit the late-game, a random 2/2 loses most of its value, but being able to kill an opposing attachment or neutralize a flyer alleviates a lot of the pain of drawing 2/2s when they aren’t very relevant. I’m not advocating taking these super early or anything. I just love having “value bears” (a Magic term) readily available in a format because they offer useful filler and open up a lot of deckbuilding possibilities thanks to their flexibility in filling out your curve. 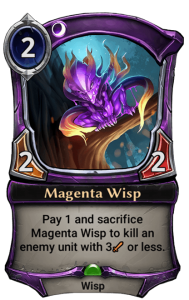 As an aside, I think it’s kind of a shame that Magenta Wisp et al. don’t cast their effects. All of them except the Yeti mimic real cards. It would be a nice little piece of support for the spells-matter cards if they cast Silence, Ruin, or Suffocate. And I’m sure they could have found a way to give the Yeti a spell. 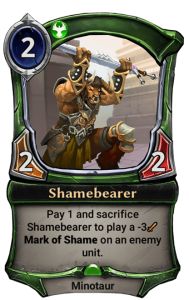 Shamebearer’s effect is a curse, not a spell, but it does already play that existing card. Perhaps DWD found that doing so pushed the spells-matter stuff a little too hard in testing. Fire and Primal’s entries are fairly bad. 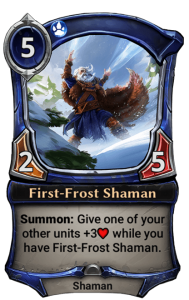 First-Frost Shaman is playable, kind-of, but you are certainly punished less by failing to anticipate it. 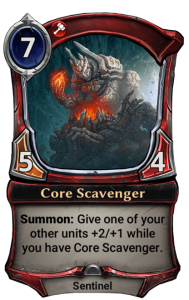 Core Scavenger is just awful. I’m not looking for 7s in my Fire decks; I’ll let Welding Torch fill that role. The other three entries are much more solid, though. 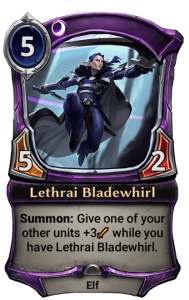 Lethrai Bladewhirl is stronger than it looks. If you’re behind, a 5/2 for 5 is very bad, but if you have a flyer, it can grant you some bonus damage while threatening to trade with one of your opponent’s big threats if you need to do that. However, it doesn’t pump the unit’s health, so if they were prepared to block, they still can unless the buffed unit had quickdraw. 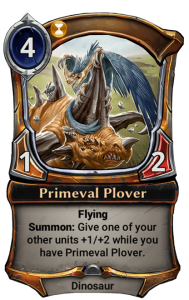 It’s really Primeval Plover and Master-at-Arms that are the most punishing if you aren’t ready for them, so play accordingly against Time and Justice. Note that even the good members of this cycle are pretty bad on the defensive, yet very powerful when ahead. One more reason to try to stay on the front foot at all costs. As rares, these will not show up very often, but they are worth keeping in mind when you make garbage-time picks late in packs. 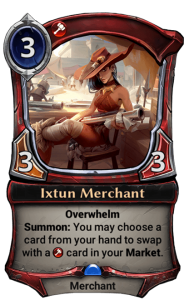 If you’re in Fire and choosing between an extremely situational card like Cloud of Ash or a mediocre unit that you are almost certainly not playing, you may as well take the Cloud in case you get an Ixtun Merchant in pack 4. It’s not a huge edge, but it is an edge worth considering. All of the merchants have quite reasonable bodies for limited, so I’m happy taking them early. 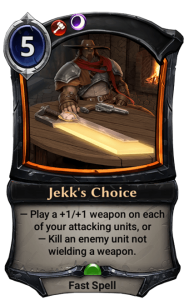 I have not yet been starved for playables in this format, so once you have a merchant, don’t be afraid to take some more narrow cards to throw into your market, rather than hedging on factions. Even just a random over-costed body is fine; I’ve traded in my 8th power for a Pit Fighter and been thrilled about it. (Note: Twilight Hermit and Winter’s Grasp are in packs 2 and 3). I was skeptical of this deck, particularly Lethrai Darkstalker, when the set was first released, but I’ve been on the wrong end enough to have come around on it. 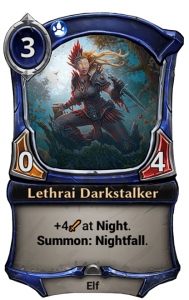 On its face, Darkstalker looks like a card that might get in for 4 once and then be relegated to blocking duty, which isn’t really what I’m looking for. However, they get absurd in multiples, and there is enough incidental Nightfall running around that you can get in there much more often. 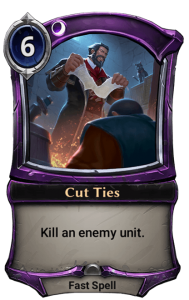 The removal in this set is clunky enough that you can usually beat them down before they can leverage their extra cards from Night to stop you. 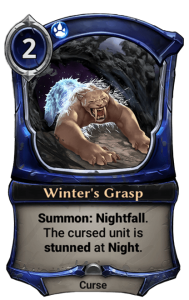 Winter’s Grasp was always a risky card, and Twilight Hermit never really got to shine in Dusk Road draft. The printing of Darkstalker and its uncommon friends in Fall of Argenport has revitalized both of these cards. 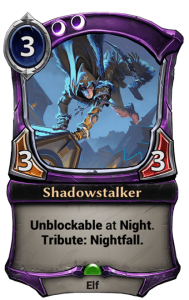 Nightfall decks previously didn’t have too many cheap, high-attack units to leverage the tempo generated by Winter’s Grasp, but Darkstalker, Shadowstalker, and Twilight Hermit all represent very quick clocks if you can keep night going. Nightfall is a mechanic that really ramps up exponentially. 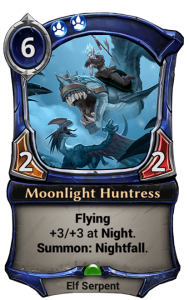 Night feeds you extra cards, which means you’re likely to find more ways to keep night rolling. It’s now in all four packs at reasonable density, something which wasn’t true of Dusk Road draft, so the deck is much more likely to come together. 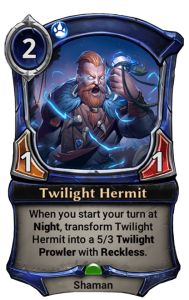 Enough of the key Nightfall cards are uncommons that I don’t think you can reliably force the archetype, but if it is open, you should not hesitate to move in. 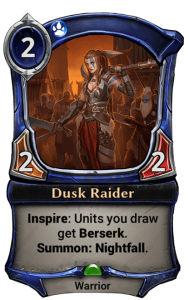 I’ve included Dusk Raider in this archetype because her Nightfall (and other Nightfall cards) make her sort of a double-Inspire unit because you get twice the chances to hit. Combine that with the large attack values of many of these night-themed units and you’ve got a huge threat all for 2 power. While the curated packs have some better ones, half of your draft comes from Set 4, and you’re not likely to pick up too many of the really great removal spells in packs 2 and 3. Hard removal is basically nonexistent in this format. These are your options for dealing with threats bigger than 3 health. Some of the Spellcraft weapons can also kill stuff, but you still have to pay through the nose to do so. This is another reason I believe it’s better to be proactive than reactive in this format. 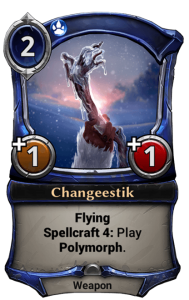 Changeestik is the only card here that I’ve found to be worthy of a very high pick (and boy is it), but that is in large part due to the flexibility of it being a cheap, aggressive weapon. I’ve played the front half by itself quite often, and it’s always great. Elder’s Feather was a high pick already! While Changeestik is powerful, the fact remains that you still need 6 power to make it into real removal. 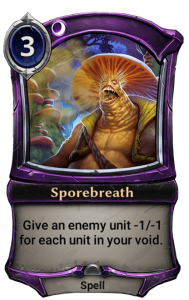 Sporebreath is the only cheap option here, but you can’t really leverage it as hard removal until much later in the game. This is yet another strike against trying to play a reactive deck in this format. Yes, that’s technically not true, but these are your common and uncommon fixing options. 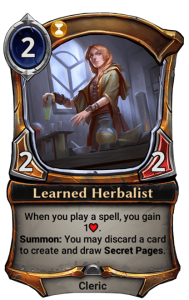 Learned Herbalist and Veteran Strategist are the only cards here worth playing (more on Petition later), but even Herbalist is fairly bad if you are leaning on her to fix your factions, since it will cost you a total of five power and two cards to get a 2/2 and a bit of fixing/ramp. That’s…not great. 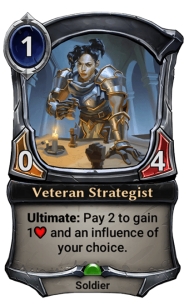 Strategist is better than she looks, since she blocks well and denies the opponent tribute, which is exactly what I want to do when I’m trying to durdle with powerful splash cards. 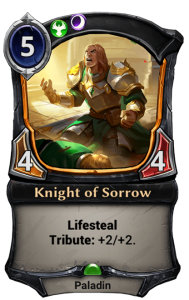 Fall of Argenport has no strangers or banners. If you want faction fixing, you’ll need to look to the two curated packs, which do have a few options. All ten banners are there, along with Seek Power and Amber Acolyte. Seek and Acolyte are often taken very early, so you’re not likely to see too many of them. Strangers are…strangely…absent. Nonetheless, I have had a great deal of 6-7 win drafts with 3-5 faction decks in the format. Your mileage may vary; I could just be a gigantic lucksack. I end up in those decks because I do tend to fiddle around hedging on factions. There are a lot of powerful, splashable cards in both FoA and the curated packs (Changeestik, for example), and the density of playables is high enough that hedging a few picks isn’t going to leave you without a real deck at the end, as it would have in Dusk Road draft. 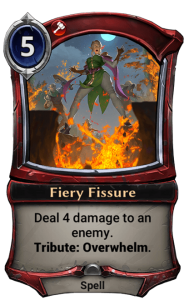 I certainly don’t think you should try to end up there, but if you pick up a few pieces of fixing in packs 1 and 2, then maybe start looking to move in on the multifaction deck. A glorified Vorlunk is the second-best common? Really? Oh yeah. This four-armed Radiant does everything I want to do in the format. 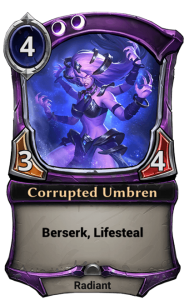 She’s got a big enough body to block early-game pressure while not being super vulnerable to cheap, high-tempo removal. If you get to untap with her, she swings a race in your favor thanks to Lifesteal. That alone means that your opponent must try to take her off the board. Ah, but all the removal is very clunky in this set! So they’ve probably got to tussle with her, which plays into combat tricks. Combat tricks that make you gain even more life. Berserk means that she can pick up weapons nicely, and her already-high health makes it hard to take her down in combat when she does. It may seem like I’m overselling this card. 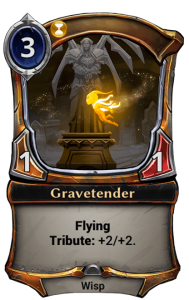 Perhaps I am, but I feel very confident in any deck that has a pair or more of these and some ways to buff them. This is a very nice draft-around card if you can get the density of enablers. 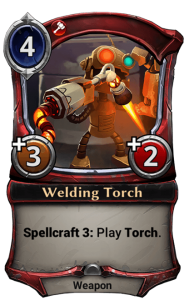 Torch from packs 2 and 3 is obviously the nuts there, but Hotblood Barbarian and the other members of that cycle can also provide cheap spells for you in a pinch. It’s at its best in Skycrag, where you can also pack some snowballs. 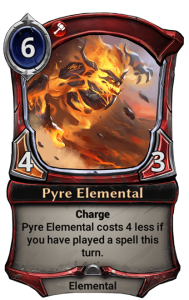 Pyre Elemental is often a very late pick, since it’s flaming-hot garbage if you can’t enable it. Don’t start out looking to draft this deck, but if you’ve got a few cheap spells and you see one of these 8th pick or later, it’s worth moving in. Some of my best decks so far have had 2 or 3. 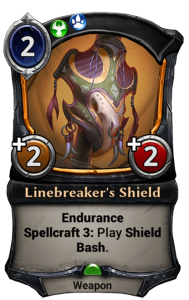 We haven’t yet had a reasonably-costed, low-rarity way of attacking multiple cards from a player’s hand. 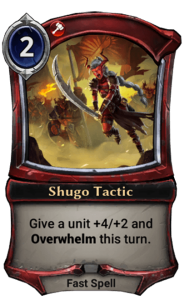 While I don’t think this card is very good, given my assessment that proactive, high-tempo strategies are where you want to be, you should at least keep it in the back of your mind when playing against Shadow. Hold extra power, and try to protect your bombs from it when it doesn’t cost you much to do so. If you see Skycrag in the opposing powerbase, have a plan for this lassie. If you see her in a pack, have a plan for putting her in your deck. She is by far the best berserk unit and just one of the best units in the whole format, thanks to the overwhelm meaning you can’t get out of her big berserk turn by chumping. I don’t think I’ve seen a game lost yet when she has gone without an immediate answer, from either side. Two of the more expensive common removal spells straight-up miss her (Downfall and Fiery Fissure), and once she picks up a Welding Torch or a Shugo Tactic, somebody is probably dead. Even if she doesn’t immediately reduce the other player’s health to 0, her 6 health means she almost always has to be gang blocked. Any combat trick that 3-for-1s your opponent will often end the game anyway. Even if you’re somehow behind, she’s still solid there, as a 4/6 blocks very well! She’s patient for someone so bloodthirsty, willing to play D until you can find a way to get her through. 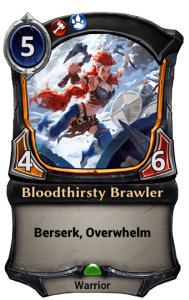 Brawler is the rare “big dumb beater” that is honestly worthy of a splash. I have done so a few times and I’ve yet to regret it. Normally I would not think this card was remotely playable, but I’ve had it played against me quite a lot, and it has done decently. I’m still not going to take it super highly, but because the removal in this format is so expensive, giving your opponent a free sigil isn’t the end of the world. 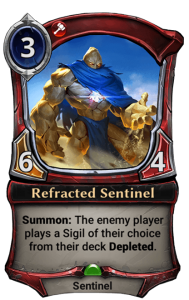 He hits very hard and basically forces your opponent to double-block and give you Tribute if they don’t have a kill spell for him. Season with some combat tricks and you’ve got a stew going. These both look like they could be very strong midrange cards, but I’ve not had that experience. I have tried, believe me, but they are very clunky in a format that punishes clunk. Ask not for whom the Initiation Bell tolls; it tolls for 1-3. At first glance, this looks like a mediocre card. Sure, if you can play it on turn 1, you can drop your monk on turn 2, and you’ve built yourself a 2/2 endurance for 2 with Scout. Cool, I guess? Any turn other than 1, and you’ve got to sink 3 power into making a 2/2, which is terrible. 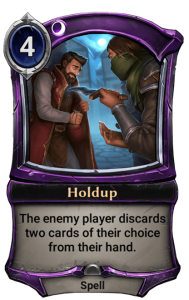 However, this innocuous little card is not-so-secretly one of Time’s best commons, and you should take it accordingly. It hits two of Time’s minor themes (endurance and spells) while also playing very nicely with Inspire. You can set up a Living Example and, say, a Xenan Lifespeaker, and suddenly your 3-power investment is returning a 3/3 with endurance and lifesteal, in addition to triggering spell themes. 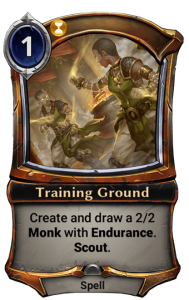 While it won’t always be that good, Training Ground fills a ton of roles in Time decks and is certainly worthy of its deck slot. 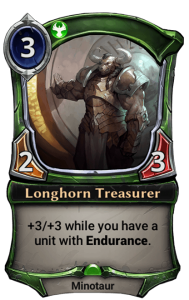 There are a fair number of Endurance-themed cards in the set, which is a bit confusing because they don’t seem to have a ton of coherence. Still, this guy is potentially insane with a fail case that’s only slightly below-rate. He goes way up the pick order if you have 3+ endurance units. 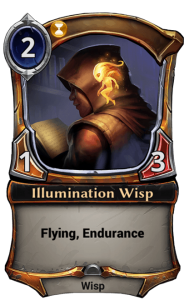 I’ve lost a fair few games to Illumination Wisp or Training Ground followed by Longhorn Treasurer. However, I wouldn’t warp a draft around him because, at the end of the day, he’s just a big unit that doesn’t generate any value. Pick up the good Endurance units to go with him and just shrug if you don’t get there. He’s fine to play even if you only have a few friends for him. This is not Seek Power. I repeat, this is not Seek Power. Petition is quite bad, and you should only play it if truly desperate. Seek Power is a good card because you can sometimes play it on turn 1, when you probably weren’t doing anything anyway. Even when you can’t play it on turn 1 or find a turn on your curve where you’ve got a free power to spend, it never really costs you a power to play it because you can just wait until you’d otherwise miss a drop, play it, and play the power you fetched. Its fail case is a depleted sigil, which is obviously not great, but not the end of the world. 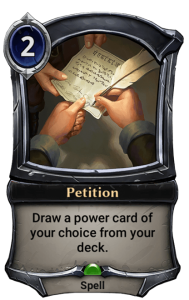 Petition, on the other hand, can’t be played on turn 1. It’s much harder to find 2 spare power while you’re developing than it is to find 1. And, even when you’re going to miss a power drop, you have to spend more than that power drop would provide, so you’re at -1 power for the turn. Again, do not play this unless you are truly desperate for fixing (or a spell to trigger your stuff). Based on the themes outlined above, my initial assessment of the format was that you absolutely want to be proactive, and after a bunch of drafts, I’m still in on that. There has been a lot of debate on whether the format is fast or not. I don’t think that’s really the correct question. Fast would imply the game ends in the early turns. While there are certainly decks like Pyre Elemental or Nightfall that can nut-draw kill very quickly, I have not found the games ending particularly early. However, that doesn’t mean that the format isn’t aggressive. That’s subtly different from fast. In an aggressive format, I want to be the one making the first move and dictating the pace of play. There have certainly been formats in Eternal or Magic where I’m content, if not happy, playing on the defensive, but this isn’t one of them. Playing from behind is a nightmare in this format. There are just so many ways to get blown out for trying to set up a blocking situation or board stall; meanwhile, there are very few good ways to leverage said board stall. Games might end on turn 8 or something, but they will strongly favor the player who was asking the questions, not the player who was answering them. 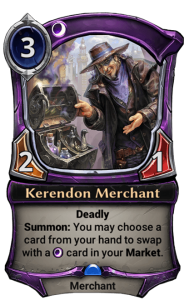 “Kill your guy, trade with your guy, draw some cards, kill your guy, slam a fat finisher” just isn’t something that is a good plan. Berserk and Tribute are both big payoffs for being on the front foot; both can slam the door on a game very early-on if the opponent stumbles. Even if the board is at parity, Berserk and Tribute constantly threaten to blow it wide open. In my experience, games that do stall out come to an end when a Berserk unit picks up a Spellcraft weapon (or something like an Aerialist’s Khopesh, which is kind of a Spellcraft weapon that always casts Jump Kick, I guess). Similarly, taking an innocuous-looking trade on a stalled board can open the floodgates for your opponent if you enable Tribute, so blocking carries even more risk than normal. But you can’t just sit there and take hits for too many turns, either. Doing so sets you up to get killed by your opponent simply going wide in addition to finding one of their haymakers. 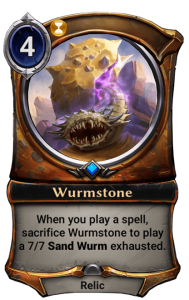 My reluctance to block in this format has meant that many games come down to racing situations, which actually makes chump blockers or things like Mining Canary into fairly decent cards. Spellcraft weapons lean toward proactive/aggressive strategies as well. All of them are quite powerful when you pay for the extra spell, but they’re also reasonable weapons on the front-end. That fact favors aggressive decks, since they are perfectly fine playing a 2-drop and slamming a +3/+1 weapon on turn 4, not to mention Berserk units essentially doubling a weapon’s effectiveness. A more controlling deck can’t as easily afford to hemorrhage value, so the Spellcraft weapons lose a bit of their flexibility. Not only that, but “going tall” (loading up a single unit with weapons) doesn’t do much in the face of a bunch small idiots that want to chew on your face. Aggressive decks get to better leverage both halves of the Spellcraft weapons. The only new keyworded mechanic that doesn’t inherently slant aggressive is Inspire. 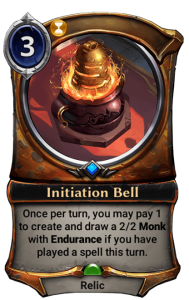 You have to both play an Inspire unit and then wait to draw a unit in order to get any value. On the surface, that seems like a mechanic designed for slower decks; however many of the Inspire units have small, cheap bodies. The Inspire player certainly doesn’t want to trade off their Inspire units, so that will also often lead to units attacking past one another, or the Inspire player taking a few hits early on that lead to them playing on the defensive, which, once again, is not where you want to be! 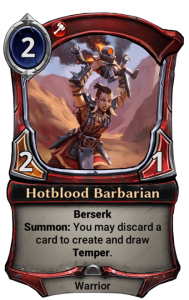 Furthermore, many of the keywords granted by the uncommon Inspire units, berserk and quickdraw, and charge, don’t do anything on defense. Even the minor subthemes and cycles of the set push it toward an early-game brawl for board control. There are a total of ten 2-drops that generate value later in the game, which will encourage both aggro and control players to lower their curves. 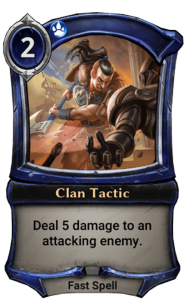 Cards like Tactics are already at their best in aggressive strategies that tend to rely less on expensive cards, but four of the five Tactics also further favor aggressive decks, with only Clan Tactic being a primarily reactive spell. The “while you control this unit” cycle mentioned above also punishes you for trying to block, since your opponent’s unit can grow out of range of your blocker, and then you’re stuck either chumping or taking a big hit, neither of which is good when you were already behind! So what do you do if you’re behind? That’s a tough question, but as someone who loves to durdle, I’ve found myself there a lot early in the format. The cheeky response would be to say, “Well, you die.” Cheeky, but mostly correct. My best advice would be to take some risks to ensure you can wrest control of the board from the opponent. Don’t take trades, even seemingly profitable ones (e.g, a 3/2 for their 4/3) if you suspect a Tribute follow-up that you can’t handle, even if it puts you relatively low on life. It’s always been said that life is a just another resource in card games, and that’s especially true when preserving your life can give your opponent Tribute. I’ve had a lot of low-life, nail-biter wins in this format because I’m so free-wheeling with my health. There are tons of huge haymaker plays in this format that are gonna kill you whether you’re at 15 or 3, so you’ve got to take some risks and just pray they can’t find them. Even if you are behind, keep fighting the good fight and chip away. Get them low enough to where they need to fear a giant Berserk, Tribute, or Spellcraft threat out of you as well. I have been able to maneuver myself into games where we are both at low health, but my opponent is reluctant to attack, fearing a major play out of me if they open themselves up to it (or, they do open themselves up to it, and I get to capitalize). The Spellcraft-fueled haymakers in this format can get pretty absurd in terms of swinging the game in a single draw step (shoutout to Final Shot; yes I’m that greedy), so playing passively is only a good idea if you believe that you are more likely to draw one than your opponent. Correctly assessing that will be the difference between a win and a loss quite often in this format. Phew, that was a long one, almost 5000 words! To summarize the summary, be proactive, don’t give your opponent Tribute unless you’re ready to deal with the consequences, and don’t expect to get any fixing or good removal from Packs 1 and 4. I haven’t discussed the curated packs 2 and 3 yet, which I might do sometime soon. 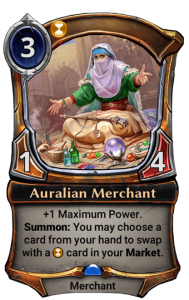 It’s interesting to see what did and didn’t make the cut, and how our evaluation of those existing cards should change based on the themes of Fall of Argenport. Next up on the docket for me will be a write-up of August’s sealed pool. I’ve got quite an interesting one brewing this go-round. Until then! Great read. Thanks for the article. I read this and then immediately did 2 drafts that went significantly better than any I’d done before for this expansion. Thank you very much.